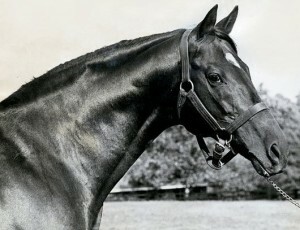 The potent influence of Nearco became personified in America by his talented but tempestuous son, Nasrullah. Foaled at the Aga Khan’s Sheshoon Stud in Ireland in 1940, Nasrullah earned an impressive reputation as a champion racehorse in Europe. Though he would not duplicate Nearco’s unbeaten record, he won five of ten stakes races and placed in three others. The bay stallion also won a notorious reputation at the track for being unruly, unpredictable and unmotivated. Bill Nack, in “Secretariat – The Making of a Champion” describes how Nasrullah was “a rogue at the barrier and a rogue sometimes in the morning.” Sometimes to motivate the horse to run, his handlers popped open an umbrella behind him. Nasrullah’s difficult behavior convinced the Aga Khan to sell him instead of standing him at stud. Irish trainer Joseph McGrath purchased Nasrullah for a reported $50,000. At McGrath’s Brownstone Stud, Nasrullah soon distinguished himself as a top sire of champions. He caught the attention of Arthur B. “Bull” Hancock, Jr., of Claiborne Farm in Kentucky, who was seeking to infuse new blood from the Nearco line into his horses. Hancock tried twice to purchase Nasrullah with no success. Finally, in what Bill Nack called “a masterstroke in American breeding,” Hancock put together a syndicate in 1949 which purchased the Irish stallion for $340,000. Its members comprised a “who’s who” of Thoroughbred breeding: Harry F. Guggenheim, Henry Carnegie Phipps of Wheatley Stable, Marion du Pont Scott and several others. Nasrullah excelled in the breeding shed, siring 98 stakes winners. Among his most famous are:U.S. Racing Hall of Fame horses Bold Ruler, Noor and Nashua. 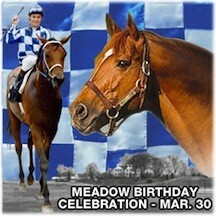 His most famous grandson, of course, was Secretariat, who was also the grandson of Princequillo on his dam’s side. Nasrullah topped the American sire list five times. Experts say he invigorated the blood of the American racehorse with new fire and speed. Nasrullah died at Claiborne on May 26, 1959 at the age of 19. Thirty years later, his grandson Secretariat would die at age 19 at the farm. In his book on Secretariat, Nack related how the stallion grooms heard Nasrullah nickering in his paddock just before he died. Knowing that the bay stallion never nickered, they realized something was wrong and rushed to him. Just as the vet arrived, Nasrullah toppled over, dead from a burst ventricle in his heart. His son, Bold Ruler, went wild in his adjoining paddock, screaming and racing up and down the fence line. The “Irish rogue” was dead, but his inextinguishable fire burned brightly in the blood of his son. And it would spark an American legend. 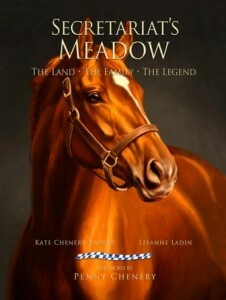 Our next blog post will be about Bold Ruler, sire of Secretariat. Coming soon in our Secretariat’s Ancestors series: Princequillo, Discovery, Imperatrice, Somethingroyal. 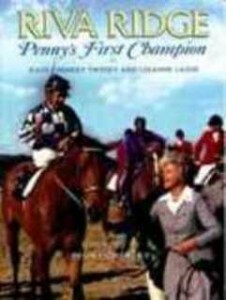 This entry was posted in Uncategorized and tagged Chris Chenery, Hill Prince, Meadow Stable, Nasrullah, Nearco, Princequillo, Secretariat, Secretariat's Meadow by admin. Bookmark the permalink.